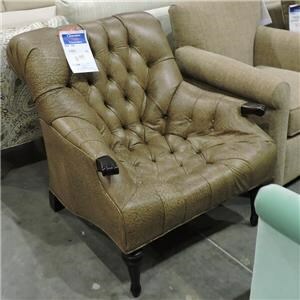 This upholstered lounge chair features a transitional design style that will blend well in a variety of decor settings. The plush box seat cushion and T-shaped back cushion offer endless comfort and support. The kidney shaped accent pillow adds extra color, comfort and texture to the mix. Pair this chair with the coordinating ottoman for a relaxing, put-up-your-feet combination. 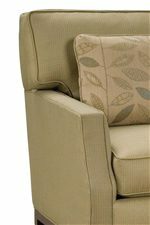 The 2758 Upholstered Lounge Chair by Fairfield at Belfort Furniture in the Washington DC, Northern Virginia, Maryland and Fairfax VA area. Product availability may vary. Contact us for the most current availability on this product. The 2758 Collection features clean lines and stylish details, sure to make a statement in your home. Loose cushion seats allow for easy cleaning, fluffing and flipping. Welt cord trim adorns cushions and arms for an extra touch of class. Accent pillows bring additional comfort, color and texture to the mix. This transitional styled collection will fit well in a variety of decor schemes from contemporary to traditional. The 2758 collection is a great option if you are looking for Casual furniture in the Washington DC, Northern Virginia, Maryland and Fairfax VA area.